came on, to talk about her Dunstan Baby Language cd. Ms. Dunstan is one hot looking mommy, which immediately caught my attention. She claims that after years of research, she was able to identify five "words" that all babies use, despite whatever language they are exposed to, to communicate their needs. Every newborn communicates from birth to 3 months using 5 distinct sounds, or “words” to express their physical needs. This is regardless of the language their parents speak and is part of nature’s plan – that your baby can tell you what they need from the very beginning. For example, every baby will say the word “neh” when hungry. The sooner ‘hunger’ is identified the sooner a parent can respond by feeding. Of course this immediately caught our attention, and we sat fascinated through the program. Trien even got a piece of paper and a pencil, and quickly wrote down the "words" and what they meant, for future reference. With Ms. Dunstan were some mommies holding their babies. They said how great it was that they could understand what their babies were trying to communicate to them before they got all apoplectic. Some of the babies even made some of the cries, almost on cue. The mommies were able to tell what they wanted, and met the need on camera before their precious one even started to cry. During the segment there were other demos of how well it worked. Oprah was surprised and enthusiastic. It was almost as if she was the presenter for a "Dunstan Baby Language" Infomercial. If I didn't trust in Oprah's integrity, (and great wealth), I'd say that was exactly what was happening. Oprah likes it. My brother's then 18 month old daughter loves Oprah. Wow! So great! Sign me up! After the program, I had to do some research. 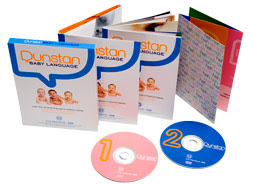 Of course, the Dunstan Baby Language website is impressive and has all sorts of testimonials and great things to say about their program, but that is to be expected. Then I started looking around, to see what everybody else had to say. It seemed like they were all equally enthusiastic. All, that is, except for the article on wikipedia, which questions her research and methodology. Other than that, every other thing I read was almost universally gushing with praise for her discovery. Of course, if this was going to be such a tremendous help to us as parents, I wanted to get it so that we could understand our baby's "eh", "heh", etc. One problem? The cost. When I first checked, it was $70 US for the package. Now it's $50 US. While that may seem reasonable for you in the USA or UK, I'm on a Malaysian salary here. Another? You can't get them to ship it to Malaysia. So I asked my brother and sister to see if they knew someone who already had it, and was finished with it. Then they could ship it out me. No luck there. I imagined that either none of their acquaintances had it, or if they did, they refused to part with such a gift from the heavens. So instead, confident in my new found font of information, I cut and pasted the "words" and their meanings, and printed them out. I had them in my pocket the first time I went to the hospital to see Melody. You know what? I shouldn't have even bothered. Melody obviously didn't get the memo that she is supposed to use Ms. Dunstan's "words" to communicate her needs. She uses one word for everything- "Eh". Ok, make that two words- "Eh", and a loud screaming cry. Nothing else comes out of her mouth except that. "Eh" can mean all the usual things: most often, "I am hungry", but also, "I have gas", "I am wet/poopy", "I like looking at Mr. Bear", "I am hungry", or "I just like confusing Mommy and Daddy as to what it is I really want." Crying? Well there is no need to tell you what that means. We can tell better what Melody wants from her body language, than we can from any "Dunstan Baby Language". Sucking on her hand or fist means she is hungry, a smelly diaper means she needs to be changed, and a pained expression on her face means either she needs to be changed, "watch out, I'm about to fill my diaper", or "why aren't you burping me?" So as for Ms. Dunstan's discovery, I'm afraid it would have been of no use to us, even if we could get it. We just have to do things the old fashioned way- watch, listen, and smell. Better yet, we didn't waste $50, and can use that money for something really useful. Like diapers and baby wipes!